Dorado constellation lies in the southern hemisphere. Its name means “the dolphinfish” (Coryphaena hippurus) in Spanish. Dorado constellation was created by the Dutch astronomer Petrus Plancius from the observations of Dutch navigators Pieter Dirkszoon Keyser and Frederick de Houtman. The constellation was first depicted in Johann Bayer’s star atlas Uranometria in 1603. Dorado contains most of the Large Magellanic Cloud, an irregular galaxy near the Milky Way. The South Ecliptic Pole is also located in the direction of this constellation. Dorado is the 72nd constellation in size, occupying an area of 179 square degrees. It is located in the first quadrant of the southern hemisphere (SQ1) and can be seen at latitudes between +20° and -90°. The neighboring constellations are Caelum, Horologium, Hydrus, Mensa, Pictor, Reticulum, and Volans. Dorado belongs to the Johann Bayer family of constellations, along with Apus, Chamaeleon, Grus, Hydrus, Indus, Musca, Pavo, Phoenix, Tucana, and Volans. Dorado has two stars with known planets and contains no Messier objects. The brightest star in the constellation is Alpha Doradus. There are no meteor showers associated with the constellation. There are no myths associated with the constellation. Dorado was one of the 12 constellations created by the Dutch astronomer Petrus Plancius, who mostly named the newly created southern constellations after animals. Dorado has also sometimes been referred to as the Swordfish constellation, or Xipias. Alpha Doradus is the brightest star in the constellation. The star’s luminosity varies from 3.26 to 3.30 magnitudes. It is approximately 169 light years distant. Alpha Doradus is a binary star, one of the brightest ones known. The binary system is composed of the primary star, a giant belonging to the spectral class A0III, and a subgiant of the spectral type B9IV. The primary star is classified as a Si star, which means that its atmosphere exhibits an exceptionally high abundance of silicon. It has a visual magnitude of 3.8, while the companion shines at 4.3 magnitudes. The system also has an optical companion 77 arc seconds away, but the third star is not physically associated with the main pair in any way. Beta Doradus is a Cepheid variable star. Its spectral type varies from F-type to G-type and its luminosity varies from 4.05 to 3.45 magnitudes. It is the second brightest star in the constellation. It is approximately 1,050 light years distant from Earth. Gamma Doradus is another variable star in Dorado. It serves as a prototype of stars known as the Gamma Doradus variables. These stars are pulsating variables whose brightness varies by less than a tenth of a magnitude as a result of non-radial gravity wave oscillations. Gamma Doradus has a visual magnitude of 4.25 and is approximately 66.2 light years distant. Delta Doradus is a star belonging to the spectral type A7V. It has an apparent magnitude of 4.34 and is approximately 145 light years distant. Delta Doradus is notable for being the Moon’s South Pole star. R Doradus is a red giant star belonging to the spectral class M8 III, approximately 178 light years distant. It is classified as a Mira variable. R Doradus is believed to be the star with the second largest apparent size when observed from Earth, second only to the Sun. The star has a mean visual magnitude of 5.40, and its brightness fluctuates between 4.8 and 6.6 magnitudes. The star’s diameter is about 370 times solar. S Doradus is a hypergiant and one of the brightest stars in the Large Magellanic Cloud. It is one of the most luminous stars known, but at a distance of 169,000 light years, it cannot be seen by the naked eye. It has a mean visual magnitude of 9.565 (its brightness varies from 8.6 to 11.5 magnitudes). S Doradus serves as a prototype of a group of variable stars known as the S Doradus variables. It is a luminous blue variable that exhibits changes in brightness over long periods of time, with occasional outbursts. It is usually classified as spectral type A0e, but in fact has the spectrum of a F0 class star. Zeta Doradus is a yellow-white main sequence star of the spectral type F7 V. It has a visual magnitude of 4.68 and is 38 light years distant from Earth. The star will move to the constellation Pictor around the year 6400. HE 0437-5439 is an unbound hypervelocity star in Dorado that appears to be receding from us at the speed of 723 kilometres per second. It is a main sequence star belonging to the spectral type BV, believed to be about 30 million years old. It is approximately 200,000 light years distant and has an apparent magnitude of 16.3. The star has a mass nine times that of the Sun. HE 0437-5439 was first discovered in 2005 by observers at the European Southern Observatory. Because it is moving at such a high velocity, the star is no longer gravitationally bound to the Milky Way and will eventually leave the galaxy and move into intergalactic space. Deep in the Chilean Atacama Desert, far from sources of light pollution and other people-related disturbances, there is a tranquil sky like few others on Earth. This is the site for the European Southern Observatory’s Very Large Telescope, a scientific machine at the cutting-edge of technology. In this panoramic photograph, the Large and Small Magellanic Clouds — satellite galaxies of our own — glow brightly on the left, while the VLT’s Unit Telescope 1 stands vigil on the right. Appearing to bridge the gap between them is the Milky Way, the plane of our own galaxy. The seemingly countless stars give a sense of the true scale of the cosmos. Every night ESO astronomers rise to the challenge of studying this vista to make sense of the Universe. 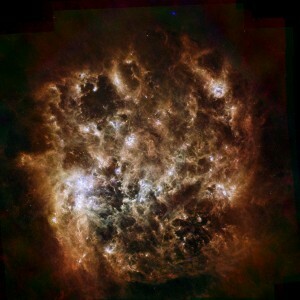 The Large Magellanic Cloud (LMC) is an irregular galaxy located in the constellations Dorado and Mensa. It is a satellite galaxy to the Milky Way, and the third closest galaxy to ours, after the Sagittarius Dwarf Spheroidal Galaxy in Sagittarius constellation and Canis Major Dwarf Galaxy in Canis Major. Having ten billion times the mass of the Sun, the Large Magellanic Cloud is only 1/100 as massive as the Milky Way. The galaxy has a radius of about 14,000 light years and is about 157,000 light years distant. It has a visual magnitude of 0.9. Its irregular appearance is believed to be a result of tidal interactions with the Milky Way and the Small Magellanic Cloud, a dwarf galaxy located in the constellation Tucana. The Large Magellanic Cloud contains about 700 open clusters, 400 planetary nebulae, and 60 globular star clusters, and is home to innumerable supergiant and giant stars. The Large Magellanic Cloud is the fourth largest galaxy in the Local Group, after the Andromeda Galaxy in Andromeda constellation, the Milky Way, and the Triangulum Galaxy in Triangulum constellation. 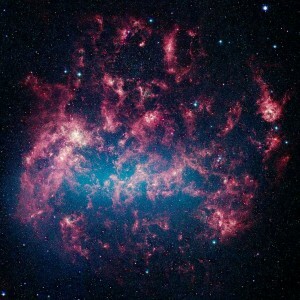 It is rich in gas and dust, and currently undergoing intense star forming activity. The Tarantula Nebula, the most active region of star formation in the Local Group, is located in the Large Magellanic Cloud. The Large Magellanic Cloud, located 160,000 light-years from Earth, is one of a handful of dwarf galaxies that orbit our own Milky Way. It is approximately one-third as wide as the Milky Way, and, if it could be seen in its entirety, would cover the same amount of sky as a grid of about 480 full moons. 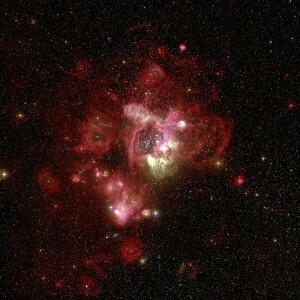 About one-third of the whole galaxy can be seen in the Spitzer image. The Large Magellanic Cloud was first mentioned by the Persian astronomer Abd al-Rahman al-Sufi in 964 AD in his Book of Fixed Stars. The “two bright Canopes” were the two Magellanic Clouds, and the “one obscure” was the famous Coalsack Nebula in the constellation Crux. It was, however, Ferdinand Magellan whose writings introduced the Large Magellanic Cloud to Europeans, and the galaxy has subsequently been named after him. 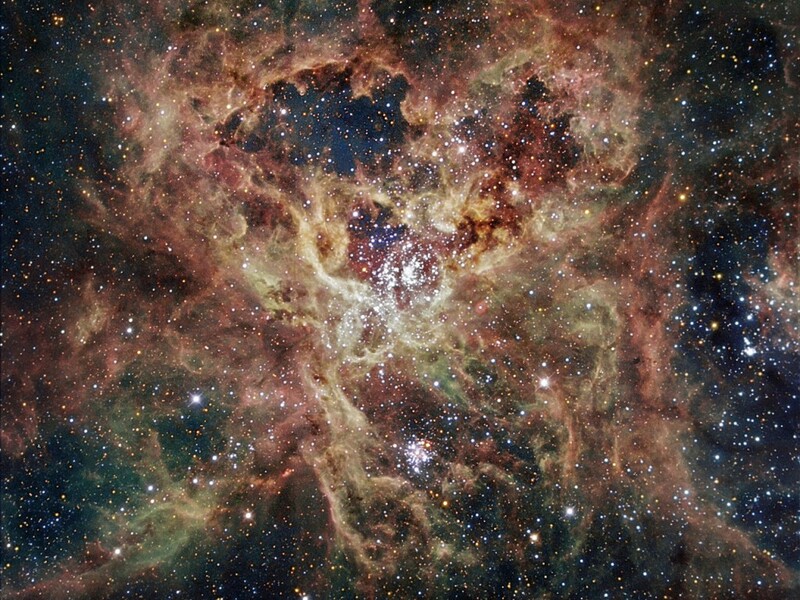 The Tarantula Nebula is an H II region located in the Large Magellanic Cloud. Originally believed to be a star, it wasn’t until 1751 that it was confirmed to be a nebula by the French astronomer Nicolas Louis de Lacaille. The nebula has an apparent magnitude of 8 and is approximately 160,000 light years distant. It is an exceptionally luminous non-stellar object; if it were as close as the Orion Nebula (Messier 42) in Orion constellation, NGC 2070 would appear so bright that it would cast shadows. The nebula has an absolute magnitude of -11.7. 500 light years in radius, the Tarantula Nebula is the largest and most active star forming region in the Local Group of galaxies. The nebula contains the compact star cluster R136 at its centre. The cluster is responsible for producing most of the energy that makes the nebula so luminous. Another star cluster, Hodge 301, is also located within the nebula. It is an older cluster and its most massive stars have already exploded as supernovae. 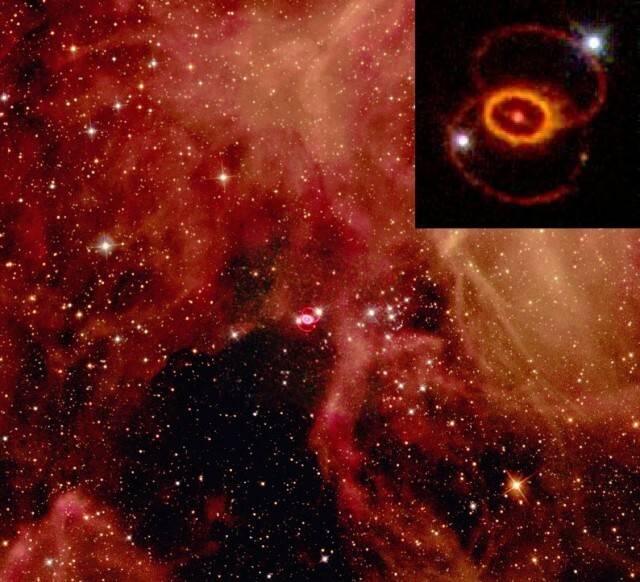 SNR 0509-67.5 is a supernova remnant located in the Large Magellanic Cloud, about 160,000 light years away. The supernova is believed to have occurred some 400 years ago and it was most likely a type 1a supernova. SN 1987A was a supernova that occurred in the outer region of the Tarantula Nebula about 167,885 light years from Earth. With a peak magnitude of 2.9, it could be seen by the naked eye. 1987A supernova remnant can be seen near the center. The image is a composite of two public domain NASA images taken from the Hubble Space Telescope. First image: Dr. Christopher Burrows, ESA/STScI and NASA; Second image: Hubble Heritage team. The light from the explosion reached Earth on February 23, 1987. The progenitor star was identified as a blue supergiant. 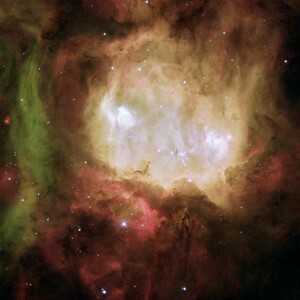 The Ghost Head Nebula is located to the south of the Tarantula Nebula and is another star forming region in Dorado, in the Large Magellanic Cloud. The nebula is 50 light years in diameter and about 160,000 light years distant. The white patch located to the west, designated A1, has a bubble at its core created by a young, massive star at the centre. 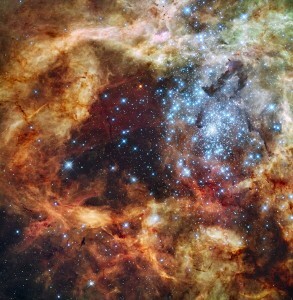 The patch to the east, A2, contains a newly formed cluster of young stars. N44 is an emission nebula located in the Large Magellanic Cloud. It is about a thousand light years wide and lies approximately 160,000-170,000 light years from Earth. The nebula has a superbubble structure, formed by the radiation pressure of a group of about 40 luminous blue-white stars located near the nebula’s centre, and it also contains a smaller bubble structure inside, designated N44F, formed in a similar manner. NGC 1566 is the brightest galaxy of the Dorado Group. It is an intermediate spiral galaxy approximately 38.4 million light years distant. It has a visual magnitude of 10.3 and is the second brightest Seyfert galaxy, after NGC 1068. A supernova was observed in the galaxy in June 2010. NGC 1850 is an open star cluster in Dorado. It was discovered by James Dunlop in 1826. The cluster has a visual magnitude of 9.0. NGC 1850 is notable because its stars are distributed as they would normally be in a globular cluster, but globular clusters in the Milky Way are formed of old stars, while NGC 1850 contains young ones. It is unlike any known star cluster in our galaxy.